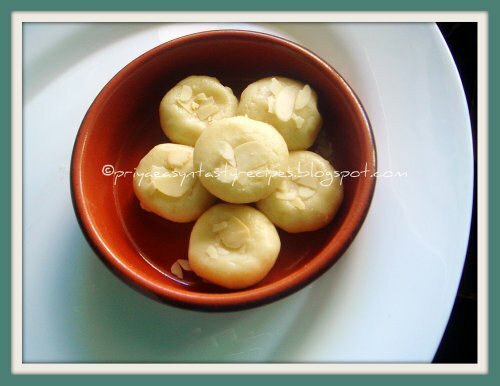 Grind the blanched almonds with milk as fine & thick paste..take this grounded paste, milk powder, sugar in a microwave safe bowl and cook in microwave oven for 5 minutes, take them out and give a stir..Let them get cool, make tiny pedas from the mixture and springle some broken almond flakes over the pedas.. Potatoes are always our favourite veggies, they have their own place in my vegetable basket..Its has been a long i prepared kurma with potatoes and tomatoes, as i bought some juicy ripen tomatoes which are sitting sadly in my fridge asking me to turn them something delicious i wanted to combine both potatoes and tomatoes to make this delicious gravy..Usually i always makes potato kurma without using coconut milk and make a paste using fried grams and spices, this time i didnt went for them and completely replaced them with coriander powder, grounded tomato paste,fennel seed powder and thick coconut milk to making this droolworthy kurma, this kurma goes terribly awesome along with rice, rotis,any breakfast dishes and simply with toasted bread slices..Sending this delicious kurma to Akila's Dish Name Starts With A along with Avocado Icecram,Apple Paniyaram & Amaranth Stalks,Oats & Channadal Stirfry and to Healing Foods-Tomato guest hosted by PJ, event by Siri and finally to this month's CWS-Fennel Seeds hosted by myself..
Heat enough oil, fry the whole spices until they turns brown, add immediately the chopped onions and ginger garlic paste, saute everything until the raw smells goes away, meanwhile grind the tomatoes as fine paste, now add the fennel seed powder, cumin seed powder, red chilly powder to the cooking onions along with salt, saute for few minutes, now add the coriander powder,turmeric powder and cubed potatoes, cook for few minutes again, now add the tomato paste, cook for 5 minutes, finally add the coconut milk,water to make a thick kurma, check for salt..Bring everything to boil and cook in simmer until the oil gets separates..
Add the chopped mint leaves and serve hot.. Many of my non-Maharashtrian friends find this combo of green beans and muth beans very unusual. But green beans are paired with different companions like green peas, methi seeds, kala vatana and good old potato too. I just realized that I haven't yet blogged many down-to-earth veggies from my mom's kitchen. Starting today, I am going to blog about these simple veggies for a week. 1. Heat oil in a saucepan. Add all the ingredients for tempering except goda masala. 2. As the chilies change color, add goda masala and saute for 30 seconds. 3. Now add green beans and 2 tbsp water. Switch gas to low. 4. Cover with a lid. Place some water on the lid. 5. When the beans are almost cooked, add cooked moth beans. 6. Add salt and sugar. 1. When not in season, I use frozen green beans. I have used French cut green beans in the picture above. Oil is tempered with mustard seeds and the chopped mango is cooked till it softens. The mango is cooled to room temperature before mixing with whisked yogurt. Serve mango raita with steamed rice or with roti. Makes: around 2 Servings of Mango Raita. Whisk yogurt and salt in a bowl. Heat oil in a small pan on medium heat, add mustard seeds. When mustard seeds start spluttering, add curry leaves and chopped mango. Cook till mango pieces soften a bit. Remove from heat and cool the mango to room temperature. Then stir the mango into yogurt. Serve mango raita with steamed rice or with roti. Notes: Make sure not to overcook mango. Suggestions: Make sure to choose the mango that is not too ripe. Variations: Use the raw mango that is not sour enough for dal or chutney. 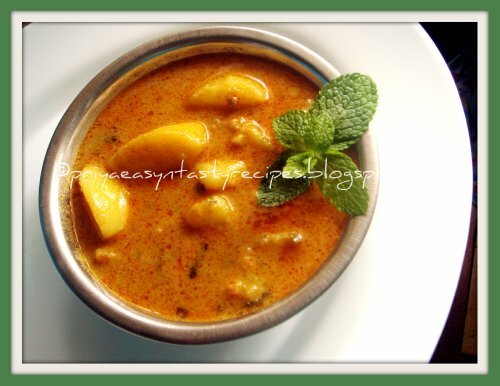 Other Names: Mango Raita, Mamidipandu Raita. There was this "cake lady" named Louiza who used to sell excellent cakes in South Mumbai. Plum cake, Sponge cake, Coconut cake, Date & walnut cake - her cakes were exquisite. I wanted to bake the plum cake, but didn't have the recipe. So I borrowed the recipe of Date Walnut Mocha cake and tried to improvise here and there remembering the taste of Louiza's plum cake. 1. Add walnuts-prunes mixture into eggs mixture. Stir well. 2. Now add dry mixture while stirring so there are no lumps. 4. Grease the cake loaf pan. 7. Let it cool in the pan for 10 minutes. 8. Invert the cake in a platter. 1. I used sunsweet brand prunes. 2. Use freshly squeezed orange juice. 1. Heat oil in a heavy bottomed saucepan. Add all the ingredients for tempering. 2. As the seeds splutter, add onion circles. 3. Saute it carefully, taking care not to break the circles. 4. As the onion gets soft, add potatoes and bell peppers. Saute for 30 seconds. 5. Add 2 cups water. Bring to boil. 6. Switch the gas to low. Cover and let it cook. 7. As the potatoes are almost cooked, add paprika, pav-bhaji masala, tomatoes, salt & sugar. 8. Let it simmer for sometime. 9. Make sure that veggies retain their circular shape. Few years back, I learnt this rasmalai from a friend. Ever since, it has always come handy as a quick fix Indian dessert. 2 cups whole milk or half and half. 1. Squeeze water from the rasgullas and set aside. 2. Mix kulfi mix with chilled milk or half-half. 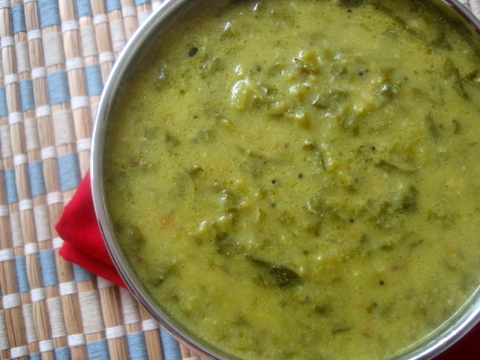 Stir in doodh masala. 3. Add rasgullas. Cover and refrigerate till ready to serve. 1. You can even buy disc shaped rasmalais instead of rasgullas. This used to be one of the popular items at the Punjabi restaurants. I recreated the recipe using the ingredients available here. 1. Rinse methi leaves. Chop them roughly and set aside. 2. Heat oil in a kadai or saucepan. 3. Add whole spices and turmeric powder. As they sizzle, add ground paste. 4. Saute for 15 minutes. 5. Add chopped methi and 1/4 cup water. 6. Cover and let it cook. 7. Add water as needed without letting it burn. 9. Garnish with chilies - if using and garam masala. 1. If you want you can sprinkle salt on chopped methi and squeeze the juice out to remove the bitterness. I find this step unnecessary since we enjoy that bitter flavor. What's the difference between dry bhel and usual bhelpuri? Well, dry bhel is the bhel without chutneys. There are two ways of getting it in Mumbai. If your bhelwala is too generous, he will give you dry bhel free of charge after eating the usual bhel/sev puri/ragda patties. Or there are those shops that sell kurmuras and chanas. Those shops also sell this dry bhel without chutneys. It's a mixture with minced onions, chilies, cilantro, raw mango - when in season, sprinkled with chili powder and chaat masala with a generous squeeze of lemon. Yum! 1. Make sure that the bhel mix is fresh and crispy. 1. Rinse the leaves and let them air dry. 2. Whisk besan batter so there are no lumps. 4. Dip each leaf in the batter and deep fry till it appears cooked on both sides. 5. Drain on the absorbent kitchen napkin. 6. Serve hot with ketchup or chutney and tea. You can serve these kababs with naans or pita breads. We love to eat them with salad. I tweaked the recipe on the back of Shan Shammi Kabab masala. 1. Add all the ingredients except herbs, eggs/bread or oil in pressure cooker or handi. 2. Pressure cook for 4-5 whistles. 3. Open the lid when the pressure drops by itself. There will be still moisture in the chicken mince. Do not let it evaporate. Let it cool down. 4. Add mint, cilantro. Now add fresh bread crumbs and whisked eggs. 5. Heat a tawa/pan. Grease it lightly. Using wet hands, make small balls and flatten them. Place them gently on the pan. Cook them on both sides. 6. Drain on the absorbent paper. Serve hot with onions, lemons, salad and Naan. 1. Traditionally, mutton mince is used for this recipe. 2. You can deep fry these kababs for better taste. 3. I more or less followed the recipe on the back of Shan Shami Kabab Masala. I have blogged about Rice Flour Flatbread from Gujarat. Now, let's visit the rice flour flatbread from Maharashtra. 1. Bring water to boil adding salt. As it boils, add oil. 2. Then add rice flour, while stirring with a fork or spoon. Switch the gas to low. 3. When all the flour comes together in a uniform mass, switch the gas off. Cover with a lid. This cooked rice flour is called "ukad" in Marathi. 4. Keep aside for 15 minutes. 5. While flour has cooled enough to handle, knead it and make 6 uniform balls. 6. Take one ball and keep others covered till ready to use. 7. Knead it again till you make a uniform ball. 8. Using dry rice flour as needed, roll into a flatbread using a rolling pin. 9. Heat the griddle/tawa or pan. Place the flatbread in the heated pan. 10. Flip back after few seconds. 11. Roast directly on the flame. 12. Place in a container, wrapped in a clean kitchen towel. 1. I have been told that with practice, one gets a perfect circular shape. Though my bhakris were very soft and tasted great with curry, I haven't yet mastered the art of rolling rice flatbread into a perfect circle! If you are fond of greens, especially Amaranth leaves aka Chauli, then I’d like to draw your attention to today’s quick and simple dish that not only adds color, flavor and aroma to your meal but loads of nutrition too. Sauteed greens are combined in a spiced yogurt sauce and garnished with coriander leaves. You can prepare this recipe with spinach leaves too. Makes for a good side with rice and rotis. Blanching of amaranth leaves - Boil 2 cups water in a deep vessel. Add salt, pinch of turmeric pwd and chopped amaranth leaves and cook over medium flame for 5 mts. Strain and use left over water to prepare chapati dough and use the blanched leaves and stalks as called for in the recipe. Snake gourd is seeded and briefly boiled in salted water till tender. A spice mixture is made with onions and red chili powder. The coarse onion mixture is then stuffed into snake gourds and cooked in tempered oil till soft. Serve potlakaya ulli karam with steamed rice or with roti. Makes: around 6 Onion. Stuffed Snake Gourd. Lightly bruise the garlic cloves without peeling. Peel the snake gourd leaving some of the peel intact. Remove ends and wash the snake gourd. Cut the snake gourd into halves and discard all the seeds. If using a long snake gourd, cut the snake gourd into 3 – 4 inch long pieces. Bring to boil around 2 cups of water, add snake gourd halves, tamarind and salt. Boil till snake gourd becomes little soft but still holding its shape. Coarsely grind onion, red chili powder and salt. Stuff around 1 1/2 tbsps of the ground onion mixture into each snake gourd cylinders. Make sure to stuff leaving around half an inch from the ends of the snake gourd. Heat oil in a nonstick pan, add all talimpu ingredients in order and add whole garlic cloves. Immediately place the stuffed snake gourd onto the pan and sprinkle little water. Cook covered on low flame for around 5 – 8 minutes or until snake gourd cooks completely. Uncover and fry the snake gourd on both sides till it turns golden brown on the skin. Garnish with cilantro and serve onion stuffed snake gourd with steamed rice. Notes: Not boiling the snake gourd before stuffing takes longer time to cook the stuffed snake gourd. Suggestions: If the snake gourd is not cooked properly, add a splash of water to the pan and cook covered on low flame till done. Variations: When stuffing the raw snake gourd with ground onion mixture, add thick tamarind pulp to the mixture. Other Names: Onion Stuffed Snake Gourd, Potlakaya Ulli Karam. This is one of the most homely chaat. You can use any crackers of your choice but I used Monaco - the salty crackers from my childhood in India. My aunt used to make many different chaats. This was the variation from usual sev-batata-puri. Sometimes she used bread croutons to make bread sev puri or sometimes she used to come up with monaco crackers as the base for puris. 1. Assemble the crackers on a serving platter. 2. Just before serving, place potatoes, onions, chutneys, sev, cilantro and lemon juice/amchoor powder with chaat masala. 3. Serve immediately before they get soggy. 1. Use fine sev for this chaat. When I eat rice for lunch, rasam is a must and the meal is never complete without it. And more so during the monsoon as this piping hot comfort soup soothes the soul. 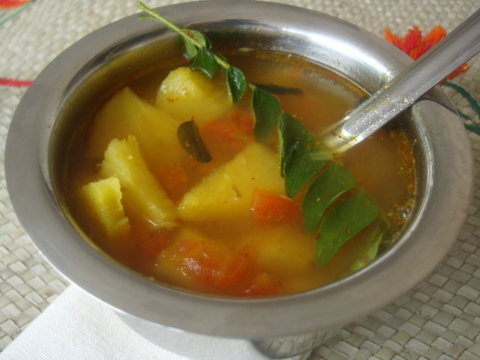 There are numerous versions of this simple soup and one of my favorite is an exotic South Indian delicacy, Pineapple Rasam. Refreshing ripe pineapple is put to good use in a spiced rasam to yield well balanced flavors – a tangy, sweet and and spicy rasam. 1 Heat a deep vessel, add 3 1/2 cups of water, mashed dal, chopped tomato, pineapple pieces, salt, turmeric pwd, green chilies, few fresh curry leaves, jaggery and rasam pwd and bring to a boil. Continue to boil for 5 mts, till the pineapple pieces are cooked. 2 Add pineapple puree and continue to cook on medium flame for 2-3 mts. 3 Heat oil in a pan, add mustard seeds and as they splutter, add cumin seeds and curry leaves and stir fry for a few seconds. Add asafoetida and turn off heat. 4 Add this to the rasam and combine. Turn off heat and place lid. Garnish with coriander leaves and serve with white rice and appadams. Suggestions: If the fritters come out too thin, make sure the besan batter is thick enough. If the fritters are little hard to touch, add pinch of soda bi carb to the batter and try again. Variations: Layer a pinch of chaat masala on top of the stuffed potato fritters if desired. Other Names: Potato Fritters Chaat, Alu Bhaji, Aloo Bajji. A chef from the food network described the taste of jicama as a cross between apple and water chestnut. I wanted to try it but was not sure what should I make. When mom was here, she suggested making the good, old koshimbeer. 2. Heat oil. Add tempering ingredients. 1. Keep the salad aside for at least 15 minutes before serving to get all the flavors nicely incorporated. Here is one more veggie-based dosas from my kitchen. 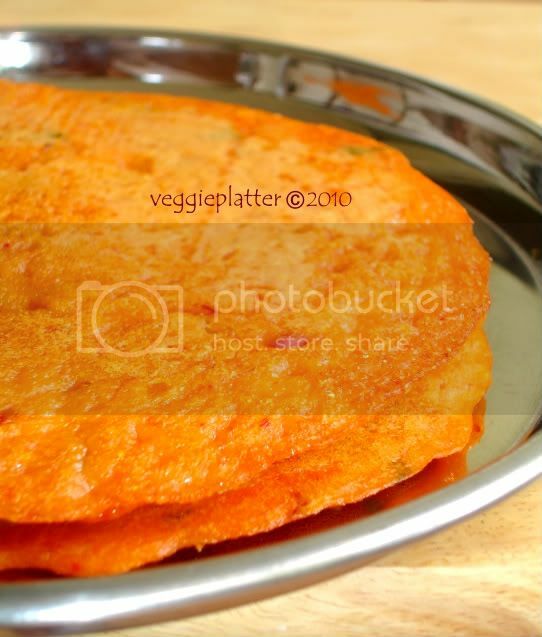 These carrot dosas need no fermentation and are good as breakfast or as a snack. They are spicier and hence taste good as it is, without any side dish. 1. Soak rice for at least 3 hours or overnight. Throw away the water used to soak the rice and wash the rice with fresh water. 2. Grind together rice, carrot, chilies, coriander seeds and salt adding sufficient water to form a coarse and thicker batter than regular dosa batter. Add minced cilantro and minced onions to the ground batter and mix well. 3.Heat a dosa pan and pour a ladle (about 1/4 cup) of batter onto it. Spread lightly into a circle with the back of the ladle and pour 1/4 tsp of oil around the dosa. Let it cook on low - medium flame, covered. When it cooks on the bottom side, flip the dosa with a spatula, spread again 1/4 tsp of oil around the dosa and let it cook for a minute. Remove the dosa when done. Fresh shredded coconut can be added to the batter. Yogurt or sour buttermilk can be used instead of water to grind the batter. Grated carrot can be added to the batter after grinding the rice. Probably, one of the most common and yummiest desserts that appears in most of the south Indian homes on every celebration has to be payasam / kheer. Also because of the simple preparation, it is one of the most favored 'prasadam'* item. Though this rich and creamy dish attains different avatars depending upon what it is made of, the milk base and the sugar / jaggery sweetener remains the constant factors of the dish. Cardamom happens to be the flavoring agent and raisins / nuts toasted in ghee serve as garnish besides adding the crunch. 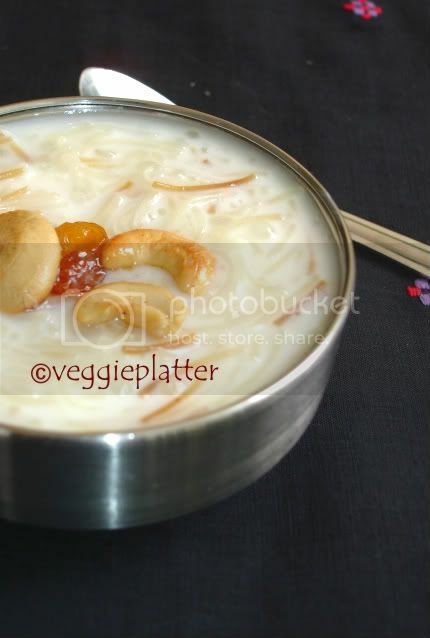 After rice, probably sabudana kheer was the most traditionally prepared payasam. 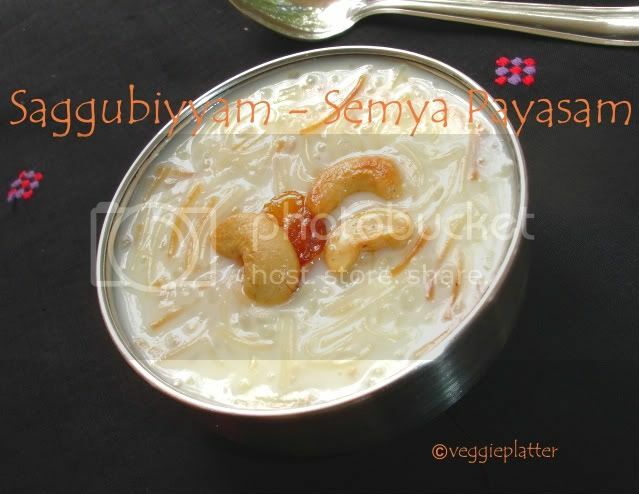 My mother sometimes happens to add vermicelli as well to the sabudana payasam and prepares this combo payasam that is equally delicious. Fry vermicelli on low flame till it turns golden brown and keep it aside. (I usually) soak sabudana in water for 1 or 2 hours before cooking. Throw away the water used to soak sabudana and wash twice with fresh water. This step is entirely optional but it aids in cooking the sabudana faster. Cook sabudana in sufficient water (about 2 cups) till sabudana is cooked and appears transparent. Keep stirring in between so that sabudana doesn't stick to the bottom of the pan. To avoid sticking and burning of sabudana, I usually use a nonstick saucepan. After the saabudana is cooked, throw away the water used to cook the sabudana. Add milk to the sabudana and start cooking again. When the milk becomes hot, add the fried vermicelli. If you add vermicelli to the cold milk, it would clump up. Cook till the vermicelli is done and then add the sugar and the cardamom powder. When the sugar melts, turn off the stove. Add ghee to a small saute pan and add the cashews and raisins. When raisins turn plump and cashews turn golden brown , turn off the stove and add them to the cooked payasam and stir once. This payasam tastes good either cold or warm. Corn is dehusked and grilled on all sides till dark brown. Grilled corn on the cob is then rubbed with chili powder and grilled again for few more seconds for one last time. It is then rubbed with lemon and served immediately. Also, use a knife to separate the corn kernels and serve in a bowl. Makes: 1 Spicy Corn On The Cob. Remove the husk and clean the corn. Hold the handle and place it on a grill. Alternatively, place the corn on a stove top with direct flame. Keep turning the corn until all the kernels change color and are cooked. It makes a crackling noise while its roasting. Once done, remove the corn onto a plate, apply red chili powder and salt to the corn with help of a tissue. Put the seasoned corn on the grill for one last time for couple more seconds to smoke the chili powder a bit. Remove the corn from the flame and rub the lemon half all over it while lightly squeezing the lemon. Serve spicy corn on the cob immediately. Notes: Make sure to cook the corn on medium – low flame. Suggestions: Roasting the corn on charcoal grill tastes better than one on the gas grill. Variations: Also add finely chopped herbs once corn is roasted. Other Names: Spicy Corn On The Cob, Kalchina jonna Potthu, jonna Pottu. This recipe is shared by my neighbor from Mumbai. I pretty much grew up eating this yummy creation! 1. Preheat oven to 350 F. Grease the cake pan and set aside. 2. Fold in dry mixture into wet egg mixture and keep mixing till there are no lumps. 4. Bake in the oven for 30 minutes or till inserted skewer comes out clean. 5. Let the cake cool in the pan for 10 minutes. Take off the cake from the pan. 1. I used Hodgson Mill Naturally White All Purpose Flour. 2. If the batter looks too stiff, add little milk - just a spoonful at a time. This kadhi was suggested by the local vadi/badi seller in Amritsar. I had to try my hands as soon as I reached my kitchen. 1. Whisk yogurt mixture till there are no lumps. 2. Heat oil or ghee in a heavy bottomed saucepan. 3. Add the ingredients for tempering. 4. Fry the vadi and onion till they are soft. 5. Add yogurt mixture and desired amount of water. 6. Add salt. Bring to boil. 7. Simmer for a few minutes before switching it off. 8. Garnish with cilantro or fresh methi. 1. Since the Punjabi vadis are spicy, you do not need to add chilies in this kadhi. Sometimes, I make a basic tempering of mustard seeds, asafoetida and turmeric powder and put vadis.